The community has a goal to generate open, workable standards for individual web-based technologies. OWASP projects are essentially a collection of correlated tasks with a well-defined roadmap and members. Organizations can use the provided information to practice more secure development practices. Among the materials offered by this community, the OWASP testing and code review guides supply developers with beneficial information for assessing software. The testing guide contains information organizations can use to apply techniques for identifying common web application or service security issues. Organizations may also refer to the OWASP code review guide to implement practices for creating more secure software. Several of the OWASP vulnerability categories are directly related to the quality and design of an application at the source code-level. These vulnerabilities can be discovered by static and structural quality analysis of the source code. As system size and complexity grow and as multiple development source work on the same code, it is important to verify conformance to security and quality standards throughout the life cycle of a project. 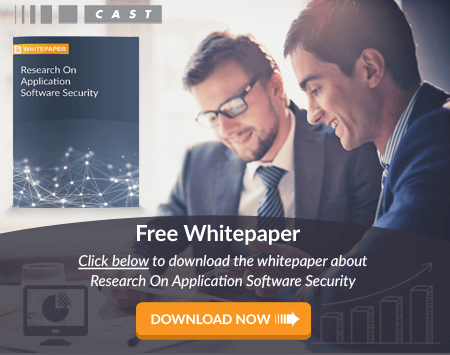 Static Application Security Testing (SAST) and architectural analysis software such as CAST Application Intelligence Platform (AIP) helps organizations build security into their software by integrating security vulnerability feedback at the development stage. CAST AIP analytical capability is not available through open source code quality checkers or utilities provided as part of the developer environment. Deep understanding of systems security is only possible when analysis techniques such as Data Flow Analysis, Architecture Analysis, Transaction Risk, and Propagation Risk Analysis are employed to identify vulnerabilities. Design flaws account for 50% of security problems and cannot be found by code review, or open source code quality tools. CAST AIP’s holistic, system-level analysis is required to understand architectural risks that pose security threats and vulnerabilities. Security training and guidance to development teams improves application security. CAST supports continuous improvement through automated feedback and training based on 300+ security best practices. CAST’s insight includes benchmarking score for consistent monitoring and offers the opportunity to improve these areas: Risk, Technical Debt, Complexity, Efficiency, Stability, and Resilience. Application security can’t be an afterthought – it has to be built into the product during development. Most developers are not security specialists and moreover individual developers don’t have the big picture view of the entire system to understand the implications of their code on the overall security of the system. In addition, manual security audits are often not thorough or comprehensive. CAST AIP, using the most advanced static analysis solution, automates the process of providing feedback to developers on security vulnerabilities right at the development stage. Most importantly, CAST AIP is the only solution that can do end-to-end analysis of enterprise applications with diverse technology stacks and frameworks across different layers. Click here to learn how AIP can help your organization follow the standards set by OWASP secure coding.